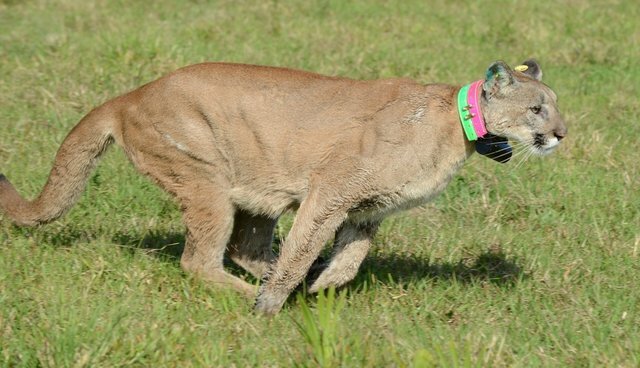 A rescued Florida panther is again running free in the wild after recovering from injuries she sustained ten months earlier. Biologists from the Fish and Wildlife Conservation Commission rescued the panther who, at age nine-months, was found clinging to life with a broken leg and bruised from an apparent vehicle strike last May. The young female cat was treated for her injuries and transferred to a wildlife rehabilitation center to learn the hunting skills she would need to survive on her own. Yesterday afternoon, the panther was escorted to a wooded area and released before a small crowd of spectators, including singer-songwriter John Anderson, who helped nudge the animal out her crate with a rendition of "Seminole Wind." The panther's successful release, just the sixth in the state's history, marks an important moment in the endangered species' recovery. There are thought to be only around 160 panthers left in the state, driven to the brink of extinction due to human encroachment. "Long live the Everglades and long live the panther," said Florida Fish and Wildlife Conservation Commissioner Ron Bergeron. "We believe this panther has a good chance of contributing to progress we are making in the recovery of this population."